Knitting the Blues: Sewing: Home Dec! Did you have a great Thanksgiving? We did. I'm glad to be moving on, though, bring out the tree! I have a couple of days of leftovers for you, even if the weather here stinks and the photos are crummy. So today you get a little wrap up of the Fall Table Topper. Being so used to sharing my knitting projects I am unsure exactly what details to include in the finished quilt posts. You've been reading about my border decisions, and helping me out with them. Usually I will tell what yarn I've used, needle size, pattern, but I didn't use the fabrics from one collection, I sort of grabbed a bunch of fabrics, some I loved and others I just thought the quilt needed. I love the outer border fabric and after I got the quilt top together I worried that it was too novelty and would take away from the sophistication of the squares, but in the end I don't think it did at all. The inspiration for this quilt is a pattern in Showstopping Quilts to Foundation Piece. It is the Stars Baby Quilt (scroll down on the link for the photo). I took a class to learn to paper-piece and I love the technique, mostly. I am still pretty inexperienced and would love to repeat the class now that I have tried it in a couple of quilts. There are a lot of little things, like when I went to sew my blocks together some of the seam allowances were going in the same direction and you can't really switch that, thanks to the piecing method. Makes for really bulky seams in some spots. I also wonder why my blocks came out small, I mean! It is sewing on the line! I measured the foundation pieces and the only thing I can think is that the little bit of fabric taken up in the seams was not accounted for. So, as it turns out, I would have had to do all that measuring and math that I did to accomodate the addition of the small inner border anyway, as the border cuts as written wouldn't have been right. Speaking of border math, I kept measuring my quilt top and then cutting my borders to fit, only they never fit and I just couldn't figure out what was wrong. I was measuring the top with a tape measure and then cutting the borders using a ruler with my rotary cutter. After several being way off I checked to see..... The inch markings on my tape measure were not the same as my ruler! How annoying is that? Makes me wonder about all of the knitted things I measure with different tape measures and then have things turn out slightly off. And which is right? What is a true inch? The inch on my rulers or the inch on my tape measures? Really irritating. I think that is my favorite square. I really love to have a special backing on quilts, but I decided on unbleached muslin that I already had for a couple of very important reasons. First, I had it in the house and second, it was already washed. That was all it took. And after much deliberation I ended up binding it in the same fabric as the outside border. For the same reasons, really. I also learned more about stitching in the ditch. As a seamstress I have stitched in many ditches and wondered why it seemed a big deal that people were, as Alex Anderson puts it in her book, poorly executing it. The thing is, in dressmaking the ditch is usually stitched in a seam allowance that has been pressed open. When the ditch is in a seam allowance that is pressed to one side it is a heck of a lot harder to successfully execute, that is for sure. One thing I figured out pretty far into the process is that when I lift my hands to move them along the quilt I go right off the ditch. I really need to stop the machine, move my hands and then continue sewing. I went off the ditch a lot of times wondering what the heck the problem was. The borders would benefit from some nice quilting, but because I cannot machine quilt well enough yet and I was down to the last second (this quilt went from the sewing machine to the table mere minutes before we actually set it and ate! ), I settled for the ditch. I might quilt the borders in the future, you never know. As we sat at dinner, Gillian and I were admiring it sitting on the table and she asked, "Aren't you worried that food will be spilled on it?" which I was. I replied that I was most worried about the cranberry sauce and wine, which was right when we saw that the wine bottle that had been passed around, had left a little dribble on the quilt. Oh well. I'll get it out somehow, right? One hundred twenty-nine. Or day TWENTY-SEVEN! Two more days of leftovers will include the Gobble, Gobble Turkey wall hanging and Crazy for Felted Pumpkins! Save your appetite! So, I went for the small border as a frame for the blocks. Amazing what a half inch can do! While I really preferred the cranberry border I didn't like the way a couple of the blocks sort of faded into it. The orange is really a contrast the entire way around, and I didn't go with the darker orange that I went out and got, I think this brightens things up a bit. Next dilemma? Sandwich it now and put a binding on it? 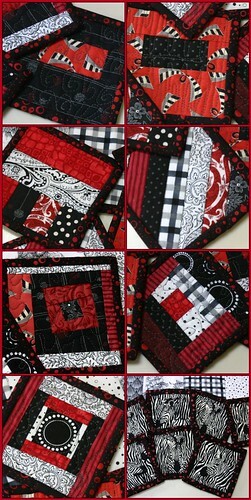 Or add the border, not a lot of work, just a little bit more quilting area........ I think I have made up my mind, but what do you think? One hundred twenty-twenty-five, yet still day TWENTY-THREE! Whaddya think? Time for a little wall hanging before Thanksgiving? I almost forgot to post! NOT.THAT! So, all you get that is new is a fall photo and some thoughts on the quilt. First, I should have known that asking you all would only bring trouble. Yes, this is my way of saying thank-you (and I wonder why I am so misunderstood, heh). As if I don't think of ways to add work to a project all on my own, I ask a group of talented and creative folks what they think of what I have and what do they do? Give me even more things to think about. Which of course stopped me in my tracks and sent me shopping. One hundred twenty-three. Or day TWENTY-TWO! Wait, is there evidence of actual knitting in this post? How Are You Liking the Foray Into How My Mind Works? If you are just checking in you will want to read the previous post before this one, get caught up! AAARGH! That tiny little bit of fabric makes a huge difference. I have a few definite opinions on the whole thing, but no time. I think if I was going to add the slim border around the blocks I might really do without the outer border. I love that brown pumpkin fabric though. Maybe it isn't for this project, well, not the borders anyway. Weird how it all changes. And now there will be math, MATH so that I can be sure the top is the right size for the pieced borders. I WAS GOING TO FINISH THIS UP REAL QUICK. TODAY! One hundred twenty-two. Or day TWENTY-ONE! STILL! Oh, the lengths I'll go for you entertainment. It's just that I can't decide what it is that I want. I made this quilt top to go on our Thanksgiving table. Cute, right? It gets an inner border, a pieced border and and outer border. I had it all planned out. The light, multi-colored fabric would be the inner border and the main fabric for the pieced border. So I laid it out. Now I don't know. There are parts of it I love, like the way the triangles in the pieced border seem to float out of the fabric, but I feel like the inner border is taking away from the center. Here it is with the outer border. So then I started moving things around. I seem to being seeing things differently in the photos than I did in real life. I like the way the center looks with the darker border inside, it doesn't sort of get lost or blend in like I feel it does a little bit with the lighter border. I'm also thinking that if I do the darker border inside I might just put the pieced border on and then bind it, leaving the outer border off altogether. Decisions, decisions. But now I have to run some errands while I ruminate over this. One hundred twenty-one. Still day TWENTY-ONE! This is the second time this week that I have posted twice in a day. Weird. You're Back For This AGAIN?! Well, I guess you want to see what the backs look like, right? There are so many ways to put a pillow together, the easiest is to cut a square the same size as the front, sew around leaving an opening for the pillow form and then hand sewing the opening closed. It has it's drawbacks: the hand-sewing for one (if you don't care for it) and the pillow is not as easy to remove as if you put a zipper there instead. I mean, I would have no problem picking out the sewing and re-doing it if I really needed to launder the pillow, but how often do people really launder these things anyway? Another way is the way that Allison suggested in her post, make two sides to overlap, you have to hem the pieces, put them together and size them to the front, but then you just sew all around the pieces and stuff the pillow form in the opening. All done. The buttons to hold the opening closed are optional. It is a little more work, not much, and you can always just pop the pillow form out and back in with no additional handwork. I did both. Why? I was not offered choices. The piece of zebra fabric I had was not big enough to cut, make hems and then overlap to leave the opening. The rest of my scraps were not big enough to cover the back of the pillow all by themselves, so necessity being the mother of whatever it is, I had to make do and make up. I totally love that I was able to center that forward facing zebra. I didn't think it would make such an impact centered, but that zebra totally looks like he is gazing right atcha! Either one of these pillows could be shown backside out, but the fronts are so cute, I can't imagine wanting to. Why is it that you never see those stupid threads until your camera battery dies and you are so.over.taking.more.photos! Oh, you must click to make them big (on my computer the big pictures are much better for some reason, always click here, always). They are too cute! Don't they look sweet with the quilt? More photos? Oh, Heck yeah! Prinna checks it out, because the old lady takes care of her Gillian. Would you just look at the cute label I made? More scrap usage! So, whaddya think? Am I finished with these scraps yet? Do I have any left? Well, yes I do. Some with Wonder-Under and even more without. Oh! The things I can do! The ideas that pop into my head! I am a woman obsessed, I have thought of a couple of things, but I have more than one kid and the others are starting to think I'll never do anything for them. I just cannot decide, keep? Chuck. Keep? Chuck. KEEP! You might not have seen the last of these scraps yet. One hundred eleven. Or day THIRTEEN! Seriously, I think I may need an intervention, I half expect to walk out of the sewing room into a gathering of my closest friends and family, there to force me to face my addiction. Insert Random Haven't Blogged In Ages Title Here. Make It A Good One, They Bug the Crap Out Of Me. Something is off a little with Typepad. That is my first impression as I begin to compose. It must really have been a while since I logged in. To have forgotten that, I mean. Yawn. I'm bored. Bored, bored, bored. Aren't you? The thoughts in my head bore me, the internet bores me, my knitting bores me (okay, not my knitting), Facebook: yawn, blog: yawn. Ravelry: Yawn. I'm in a bit of a lull with the internets these days, it has happened before and as it has before, a spark of interest will return to my cold heart and I'll be all back into it. Of course, I have still managed to waste a.lot.of.time on the boring internets. There was the day last week when I could have gone to work, but instead I spent hours (really HOURS! people) looking for sea glass earrings and beads on Etsy. Etsy doesn't seem to bore me as much as the rest of it all. All I got for that day, in the end, was a feeling of a wasted life and no sea glass earrings. I liked too many and couldn't decide so I shut the computer down and wasted time on something else I am quite sure. I can't remember what, but I'm darned sure it didn't involve planning a meal for my family. Yawn. All this boredom also doesn't mean that I haven't been reading your blog. Yours, too! And yours, yours, sometimes yours.....nope, not yours, probably yours, over there in the corner. If not yours, it is only because I probably don't know about it yet. I might have even left a comment on.......no, not you, or you. Maybe you. Definitely yours! All of this maybe reading and rarely commenting means that on the rare occasion that I post I am pretty sure the rest of you are either a)probably not reading anymore. Can't blame you, I bore myself, b)not commenting because even though you find me almost read-worthy you can't find a single thing worth saying about what I have written or c)treating me as I treat others. Mind you, this is not a whine or a tactic to weedle out a comment, I am right with you on all of those things and they are all legitimate. I haven't a feeling about them one way or the other. It is what it is. Nobody knows that better than me. I.am.so.bored. Thankfully my boredom comes when there are plenty of reasons to be doing other things. Sometimes (when I am not spending too much time on the internet-which I really have been-and I can only blame the weather some of the time) I am doing other things. Knitting, spinning, sewing or sunning being chief among them. I have a shawl (!) to show, but I haven't photographed it yet. I'd show you my tan, but I wouldn't want to make y'all jealous, although it isn't much of one considering the weather. (Yes, I know, I promise that my face never sees the sun, and while I use sunscreen on the rest of me at the start of the day.......) How about some interior, hmmm, design seems to supercilious a word to describe what I have been doing, but there has been a teeny bit of sprucing up to the game fiber room. We have a large room at the back of our house that leads out to a three season porch and the backyard. It's main attraction is a pool cutting table, there is a cat-hair covered couch, some book shelves filled with knitting, quilting, sewing, needlepoint and spinning books, containers with fiber and yarn and my sewing cabinet. One corner houses a computer table which for a lot of years held the desktop computer that the girls and I shared for a long time. For one reason or another (leaving for college, the continual crashing of the desktop computer) we have all ended up with laptops. Now, that corner of the room never seemed to feel organized, no matter what I did. When it was being used on a regular basis as the computer spot there was always a mess there. Computer paraphanelia, printers, multiple towers, manuals, software discs, hundreds of miscellaneous disks, cartridges, paper for the printer, wires and cables (in use and not) homework messes, spills, plates left, fast food debris, you name it, it could get really disgusting there. As soon as I had my own laptop I pretty much ignored it until we might be hosting company and then would flip out in an attempt to organize it all and, organization not being one of my natural talents, it just never would be neat. Even after we all had laptops, the printer was there so homework would still be done there with all of above messes piling atop another atop another. The room had been pretty much closed up for the winter unless I went in there to sew or retrieve something, so this spring when we started leaving the door open and using it again that corner sent me over the edge. I threw almost everything away because I was pretty sure that software for a computer that we hadn't owned in years and manuals for ancient programs had decided their new mission in life was to send me over the brink of sanity. I cleared and dusted and scrubbed and vaccuumed and transformed that corner to a corner of nothingness. All that was left was the internet box, a router and a printer along with that computer table. While it was clean it still was icky and Pete was set to destroy the computer table and I was set on destroying the printer etc. when it struck me that I could make it look nice! I do that! It is easy for me. Of course, what started out as two quick little table cloths...... I found a crappy little end table in the basement, made a tablecloth for that to hide the internet cables and router and put the printer there. While Pete really thought dumping the computer table was the best idea, I had in short order crammed sewing junk under there, interfacings, patterns, cotton batting and fabric scraps. Not prepared to lose the new storage space OR purchase furniture to replace it at this time, I went on a fabric dive at work and found these. The original plan? The check for a tablecloth on the small table, the stripe would be skirts with velcroed bands to stick to the computer table. I can never do anything that easy. First I thought a contrast welt would be so.cute. on the tablecloth which, by the way, has only three sides to make it simple work to run all the cables and crap behind it. Then I thought, "wouldn't it be just adorable to have a bias band on the bottom of the skirt for the computer table?" If there is a way to turn a quick and dirty project into a full scale production I will find it. But man, it tickles me to no end, every time I go in there, to see the transition in that corner. Formerly a scene of chaos and disaster, it is now neat and organized and a little sewing/quilting center. Well, there may be a little bit of chaos left underneath. At least it is hidden, right? In case you are wondering: sticky velcro . It is sort of doing the job it claims it should (super sticky, holds all of your decorating jobs! ), but I think we may be stapling the velcro to the table for security. There are a couple of other cute spots in that room, I'll have to get photos of them as well. All the better to bore YOU with, right? THIS IS YOUR WARNING TO AVERT YOUR EYES OR MOVE ALONG TO ANOTHER BLOG IF YOU ARE BURN SQUEAMISH! In the category of Lessons I Cannot Learn The First Several Times They Are Taught let this serve as a lesson to STAY AWAY FROM THE PIPES ON A MOTORCYCLE!!!!!!! That blister measures about an inch and a quarter across, but funnily (because there has to be something funny, right?) doesn't hurt all that much. There is the occasional sharp pang of pain, and I do not look forward to the inevitable.... The bruise is fairly spectacular as well, but that lesson never learned is the DON'T WALK INTO THE DOOR TO THE DISHWASHER or QUIT LEAVING IT OPEN TO BEGIN WITH, THEY WILL NEVER GET THAT IT HAPPENS TO BE THEIR INVITATION TO PUT THEIR STUFF IN IT ANYWAY! In happier news, I went with pink polish and white polka dots. Of course the lesson unlearned and showcased in this photo is TAKE BOTH SANDALS OFF WHEN SITTING IN THE SUN SO YOUR FOOT LOOKS TAN INSTEAD OF JUST DIRTY. Seventy-eight. The unlearned lessons. I'm rich with them. I wonder how many I've brought from past lives, never learned yet. And then, just how many will follow me on into future lives. It is a scary thought.